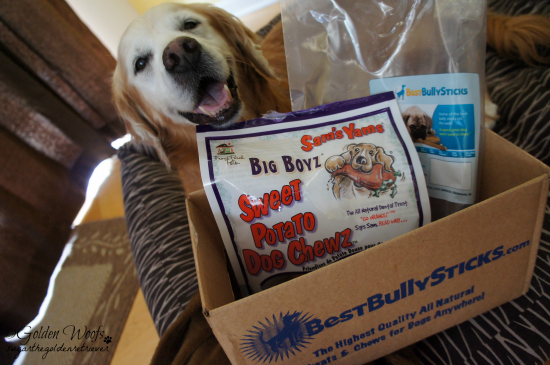 Golden Happy to receive tasty goodies from Best Bully Sticks, Sam’s Yams Sweet Potato Chewz and of course bully sticks. 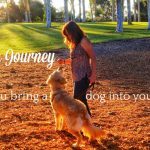 Best Bully Sticks is a VA based business that offers high quality Bully Sticks, Dog Treats, and Dog Chews at great prices. Sam’s Yams is a brand I am familiar with. It’s my favorite Sweet Potato Chew. 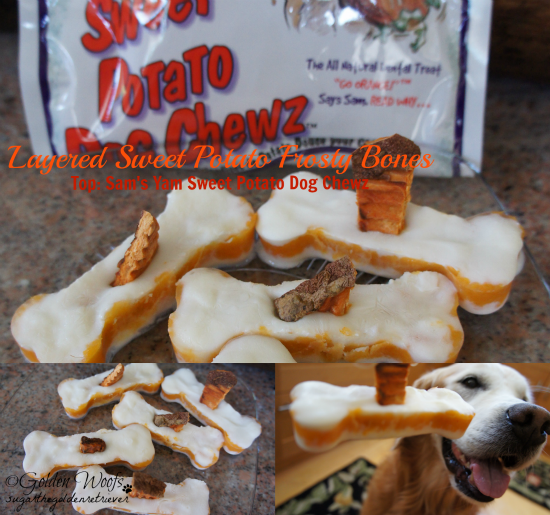 Mom decided to make some Sweet Potato Frosty Bones to compliment Sam’s Yams Sweet Potato Chewz. 2) Add the mashed sweet potato on top of the frozen yogurt. Cut a Sam’s Yams Sweet Potato Chewz into a small pieces and place it in the middle before adding the 2nd layer of yogurt. 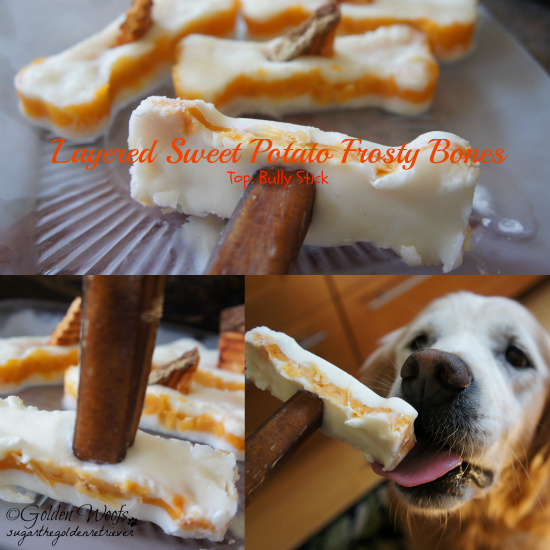 One of the Bully Stick I received was used to top one of the Sweet Potato Frosty Bones. Disclaimer: Best Bully Stick provided Sugar a bag of Sam’s Yams Sweet Potato Chewz and Bully Sticks. Golden Woofs: Sugar The Golden Retriever was not compensated for this post. Beamer loves sweet potato chews. We usually make our own because I splurged and got a food dehydrator. Enjoy those frosty treats and stay cool! Wow that looks good – I think I will go shopping for a sweet potato. Have a tasty tuesday Sugar! You realize how lucky you are to have a Mom like that, right Sugar? YUM! A yummy on a stick. Now that is what I call tasty! My guys love sweet potatoes! I always bake an extra large one and them share with them. Love it! Sam’s Yams is based in WI. The owners are fabulous, we had them where I work for our 10 year open house at Harmony Pet Care last year. Will be trying out this recipe. Did you use fresh sweet potatoes or canned? DROOL is RUNNING like a RIVER here Sugar. They look SOOOOOOOO TASTY. We too must go and get some sweet potato and have a go. Have a terrific Tuesday Sugar and stay cool. As always, yummy looking treats Sugar. Moms has promised she’s going to make something soon! We even have some of those sweet potato chews. Hurray for the layered sweet potato treat! Your mom sure makes you feel special Sugar. I know she does too. You make the best looking treats ever. I always want to sample them. Mmmm. And I’m not even a dog. I might have to drive up for a visit some Tuesday. You could make those in a popsicle mold with that piece as a handle too 🙂 I am not much for sweet potatoes, my sister loves them but I am not big into veggies, I like fruit. Cool idea and Mom may have to find some Sam’s Sweet Potatoes for Katie, we have Best Bully sticks already. Those look mighty tasty Sugar! Ooooooooh, my girls will LOVE these treats!! I used to get the sweet potato treats from Drs Foster & Smith until I read some very disconcerting reviews about them. Now I get the WellPet treats that have some sweet potato in them. 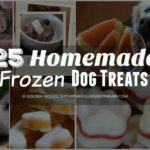 BUT, I’m going to start making their treats — at least frozen ones — myself on a regular basis. Have to do some grocery shopping today — will pick up a couple of sweet potatoes and make these when I get home. (I’ll use the paw shaped molds.) Thanks for sharing the recipe! Don’t you freeze the potato first, before putting on the top layer of yogurt? HEY SUGAR EXTRA TASTY TODAY. I ACTUALLY LIKE SWEET POTATOES!! I don’t care for sweet potatoes, so I don’t ever buy them. I should get some and try this for my boys though. Wow, we gotta try some of those. We got hungry just reading your post!! I love Sam’s Yams! I’ve got to ask mom to buy me some more. Those Frosty bones look yummy! Mom….can you please make some for me? Pleeeaaasssseeee…..
Oh yummy. We would love that. Yum! We’ve been big fans of Sam’s Yams for a long time! But sadly, it’s been a while since we’ve had them in the house. Kind of on a diet around here, so treats have been at a minimum. 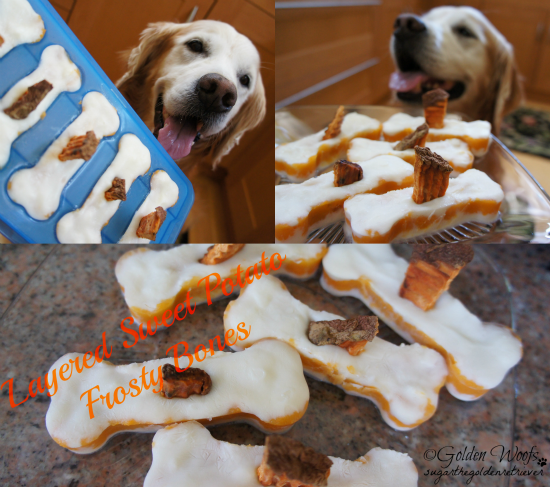 But these Sweet Potato Frosty Bones sound awesome! Your mom always makes the best treats! Will definitely be sharing and pinning. Those are so pretty and fancy…and yummy is a plus! these treats sure look good, could’ve used one after our walk this morning!! Sugar, you are such a lucky pup. My mom doesn’t cook. According to her she dusts the stove. How can I get her to make one of your mom’s recipes? Very clever!!! Oh, my mouth runneth over…. Drooling over the flavors and pictures! Gonna have to give this one a try soon. I never realized Best Bully Sticks was VA based! How wonderful! I think Luna would love to try the sweet potato chews. We will have to check them out! Your mom is so creative! The treats look awesome – great job! These treats are great. Defenitely going to try the sweet potato. Always on the lookout for new stuff . I bought some dehydrated sweet potato chews for the dogs, but both of them have had trouble chewing them (stuck to their teeth) so the dog daddy said stop feeding it. 🙁 Those frosty treats look good.